Many of us of Styrofoam as a reference to most plastic foam packaging,we include foam drinking cups,packaging materials that our appliances,toys and so many other items are packaged in. Firstly, i see the different pictures made of Styrofoam also the magazines,books, short stories and others,by the work of Juan elani tulas.Juan elani tulas an artist from Baguio city and locos sur,I think juan tulas the only purpose while doing this used of Styrofoam to make people understand that they have the power to change the world and avert climate change.In conclusion ,I hope that juan elani tulas is a very good example that someday,I hope that his artist will allow people to find pleasures in segregating their trash and minding how t dispose the garbage,so that the whole entire earth wont be destroyed. We are all leaving in a world of art. Why? because I know and noticed that without “Art” we will not be appreciating the beauty not just in the physical way but also the beauty of what is hidden in that particular being.Many of us, including me don’t appreciate much of the works of our beloved artist, because I believe that artist are not just making or creating something just to make them famous.They make because they want to send a message in every masterpiece . Artist have a very unique mind because they are so creative. In this “Kwentong Styro” , it shows that we can make a masterpiece out of a styro in which most of us think it was all just a garbage after using it. Mr. Juan Tulas shows that we, Filipino are really creative in many ways. All we need to do is to have patience, courage, and self confidence and creativity to do such thing . Base from my own understanding ,in his works, he shows our nature as filipino. At first and until now, i really didn’t get what really the purpose of Mr Juan Tulas in those arts. But I believe that he has a message from those piece to everyone. With that work of Mr. Juan, we should be able to appreciate the importance of those materials from the garbage that maybe they have still some uses that we just don’t know it. I believe that Art is everything. Styro? Basura lang yan. Walang kwenta. Matapos gamitin, itinatapon na lang kung saan-saan. Pero para kay Mr. Juan Tulas, may silbi ang isang styrong walang kwenta para sa iba. Sinong mag-aakalang ang isang styro ay magiging isang magandang art na gawa ni Mr. Tulas? Na kahit basura lang ito, puwedeng makabuo ng isang magandang arte na batay sa ating buhay. Base sa ginawa ni Mr. Tulas, na gawa sa isang styro, ito ay nagpapahiwatig ng isang magaling na imahinasyon, dahil sa isang styro lamang naging isang magandang art, basura lang siya na inaakala natin pero may maganda naman itong resulta. Hindi ko man alam ang ibig sabihin ng kanyang mga ginawa pero para sa akin, ang mga ginawa niya ang simbolo ng isang pagiging (1)matiyaga niya dahil sa hirap ng paggawa nito, naging matiyaga pa rin siya para lang makabuo ng isang magandang styro art; (2)malikhain; at (3) tiwala sa sarili. Hindi lang siya malikhain kundi nakakatulong din siya sa ating kapaligiran. Alam natin na ang mga plastik ay walang kuwenta na itinatapon lang natin dahil ang alam natin walng silbi pero sa pamamagitan ng art, ang mga walang kuwentang sinasabi natin ay may maganda resulta sa ating buhay. Tularan natin si Mr. Tulas na binibigyang halaga ang mga basurang walang kuwenta, hindi lang ito makakabuo ng isang magandang art kundi makakatulong din tayo sa ating kapaligiran. All of us expresses our own emotions through our actions. For example, people in the stress who are vandalizing the walls of some establishments, where in they expresses their emotions on doing those kind of things, and sometimes it also shows us that many of them has talent in arts. In the works of Juan Tulas, he used Styrofoam which turned out to be a recyclable material because he used it on his works to be more constructive, helpful and creative. Helpful? because it wasn’t been just thrown somewhere else but it is used to be more creative and more productive. In the arts of Juan Tulas it shows us the value of recycling those things because it has a big help on the environment. On his works such as “Bukang Liwayway”, “Dapit Hapon”, “Tag-ulan”, etc. he showed to us his Love for nature, in giving importance to it, helping nature to be given more concern. Life is a matter of choice, choice to live and choice to depart this life that we have. Being part of this world feels so much hopeless to conserve our own mother earth. We people are destroying our own life as we see and witness what is really done in our nature today. But what I’ve seen at this moment gives me hope and courage to live more, knowing that we must not destroy our own future. Mr. Juan Tulas with his own way of expressing his love to the nature in the form of arts gives contrast to me to be more aware about conserving our nature. And by he’s own way of creating his own masterpiece is a good start for a new beginning and an exemplary not only for him but for everyone, and through our own curiosity about things could lead us to knowing and by that knowing it could lead us to learning. Art is part of us. Art is like a blood that runs through our veins which sustain our life to live.How?, By simply living in a right way and create extra unique things then show it to the world.What I mean” to live in a right way” is by applying art in every act that we do to come up with a good result. Just like doing a piece of art..If the artist applies his skills as an artistic he will come up with an amazing and creative work. One way of creating extra unique thing is to make an obra maestra that is from your own idea,effort,patient and talent. A piece of art that would make others amazes and inspired. Just like the works of Juan Tulas which became very creative in his Styro Art. After seeing his works I was amazed with how he gave life to those used styrofoams and how he transformed trash into treasure. Styro is just a common thing that we discarded every day, but Juan Talus used this pre-existing material and reinterprets it then made it in new form with new purpose. His works shows not only the importance of recycling but also the art itself which can catch the eyes and capture the attention of the viewers. Itapon ka nalang ba kasama ang mga pinaglagyan ng nga pingkainan sa McDonalds,Jollibee,Chowking? Pagkatapos Lang panlagyan ng PRUTAS, nga pinagkainan sa isang restaurant makikita na Lang ba kita sa estero? Mula sa karton ng mga bagong appliances, at kagamitang bahay sa basurahan din ba ang bagsak mo? Styrofoam would take a million of years to recycle itself but it could take a few seconds to dilute it into art. Styrofoam. This plastic material is used for food and drink container, packing materials, and other items. Polystyrene, made from petroleum, has been linked to cancer in humans. It’s also bad for our environment because it takes a very long time to break down. Many communities have banned the use of Styrofoam. Until it is banned in it’s entirely, it may be beneficial to know how to recycle Styrofoam. Some of the artist here in Laoag encouraged to donate some styrofoam to be recycycled and they used styrofoam to create a unique and very artistic art that we can lessen the Plastic Garbage in our society and they used to think a good ideas to used that styrofoam to create different and meaningful art form. Styro art is a new form of art using recycled materials as the medium to create artistic projects which can generate income. During the exhibit at samtoy bookstore of Mr Juan Elani Tulas who was one of the few artist in the Philippines who experiments by combining wit fantacy, activism, and nature. We viewed some of his array of paintings in different subjects using various mediums such as oils, water color, pen and ink. This exhibit is very helpful for us especially to the fine arts students to gain more knowledge, have an ideas and creativeness to make an own artwork. Instead of burning styrofoam, lets just recycled our residual waste not only to save our nother earth but to produced millions of beautiful and colorful artworks. All of us want to expresses our feelings in many ways. Some of us expresses their feelings thru an arts. Having a good mood making an artwork is having a beatiful piece of art. With this styro artwork made by Mr.Tulas, he come up with a beautiful and very unique artwork, A STYRO ARTWORK. Who could imagine that a piece of a styrofoam can make a beautiful artwork? Mr. Tulas really had a wide and bright imagination with that kind of artwork. Instead of burning the styrofoams we.used and adding the wastes in our surroundings, we can reduce the wastes by making things from a recycled materials to help and protect our Motheq Earth from destroying. We can make artworks made from recycled materials like what Mr.Tulas did and we can also make mother earth clean and a happy place to live in. Recycling millions of styrofoams would mean producing millions of colorful artworks. 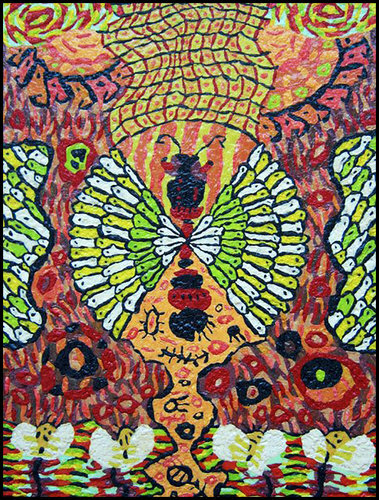 my observation and reaction to the art exhibit and to the art works for the Styrofoam art collection,is that i saw their Styrofoam become an amazing artwork there are looks like an butterfly,and confusing formation of art work,in this artwork he is using Styrofoam to express his feelings and also helping mother earth at the same time.because he is using styrofoam so is lessening the plastics that can be decomposed about a hundred years, that can destroyed the ozone layer by burning it global warning also and this big flush floods due to the plastic scattered everywhere . he is good example to us we must help Also to prevent disaster by simply putting your garbages in to their proper places and even recycling this are just simple way to save our mother nature. In everyone’s life…. there’s we called a lucky break. A lucky break that we can share our talents,emotions,and imaginations.Everywhere there’s a Styrofoam and plastics in the surroundings. And we didn’t noticed that Styrofoam has an important role to one’s every life. Mr. Juan Elani Tupas he developed his capability to share his art work by using Styrofoam. And he created a Styrofoam art painting that can be expressed his sentiments in nature. And i was amazed because it made me realized that Styrofoam is not a Styrofoam but it has a sense. We all know that styro is a waste product, and we usually used it in different occasional events like birthday party, but after we used it, we just throgh it anywhere we want to. nakasanayan na nating magtapon kung saan-saan na parang wala lang. this can cause a damage to our mother earth beacuse we nver learn to through our waste product in the right place. By using styro through recycle, we can make an art. Styro is a waste product but it can also turn into art. I appreciate the work of Juan Elani Tulas because through his wild imagination and patience, the styro turn to Styro art. all the styro arts he made was wonderful, but eventually there are questions put in my mind. What did he do to the styro to made it colorful, and what did he do to so that all the colored styro connected? I was totally iamazed on what did I seen in the art gallery because all the styro art is colorful and can easily described and imagined what is featured in every art. And what i loved the most is that, the art entitled hanging habagat. Art Exhibits? Well, Im not into arts, in the sense that I can’t paint and draw impressively. But I am aware on how arts play a big role in our society. Plus, seeing some of Mr. Juan Tulas masterpiece, is somewhat an honor to be one of his viewer! Styrofoams is used for my packed lunch, for thermal insulation and in packaging appliances, but while stepping in front of this styro-artworks exhibit held at the Samtoy Bookstore, La Tabacalera Lifestyle Center, Laoag City, the styro environment stabbed a captivating experience towards for an undoubtedly, very creative creations of a genius artist. Looking on his works of Bukang Liwayway and Dapit Hapon with their dancing colors, it shows the beauty of nature which implies a very colorful sight during the dawn and late afternoon. After, seeing the first two arts, I keep on tracing the figures shown on the next styro arts and observed different stories drawn unto them. Some of which I observed is that it reflects on the relationship between people and our nature. Climate and Trees drawn must be a calling that we must maintain a clean and green environment, wherein I interpret the “TREE CHANTER’s”as a voice of our nature who is in great danger because of Illegal Activities. .I don’t really know what Mr. Tulas had exactly on his mind while doing these arts but I am sure that he wanted to show something about our wonderful nature which can be barely seen by the people. Aside from that, I really appreciate that he used recycled materials, specifically Styrofoam on doing his arts. A Filipino marked of being creative and resourceful. Also, It gives me the idea of doing the same thing with Styrofoam that right after I leaved the exhibit I should try doing an styro arts too. But well not as good as Mr. Tulas :). The only thing I can say to conclude this, is that, it can add years to live upon seeing this exhibit. Thank you Mr. Tulas! Tayong mga tao ay mahilig tayong magtapon ng mga gamit na natapos na naitn gamitin, isa na dito ang styrofoam. Ginagamit natin ito sa mga packaging lalo na sa pagkain at maiinom, may mga baso, pinggan na gawa sa styrofoam, ito’y ating tinatapon sa basurahan lamang pero si Mr. Juan Tulas ay binigyan niya ito ng panibagong larawan ang isang styrofoam. Ang kanyang mga gawa ay napakaganda hindi mo ito akalain na ito ay gawa sa styrofoam na binabasura lang natin, kung tatanungin mu ang iyong sarili makakagawa ka rin ba ng isang sining na galing sa basura. Malikhain ang kanyang mga kamay at isip sa paggawa ng kanyang arts. Halos ang kanyang mga ginawa ay tungkol sa ating kapaligiran, pinapakita niya ang kagandahan nito, upang sa ganoon ay maisip natin na panatilihin itong maganda. Ito rin siguro ang kanyang naging dahilan kung bakit ang styrofoam ang kanyang ginamit sa kanyang mga ginawa dahil sa gusto niya itong ipahiwatig sa atin na dapat huwag natin pabayaan na ang mga basura ay hindi dapat ikalat lamang bagkus dapat naitn itong, gawing isang magandang bagay upag makatulong tayo sa ating kalikasan. Ang basura ay parang ginagawa natin itong walang silbi para atin, pero sino nga ba ang gumagawa ng basura kundi tayo din diba?… kaya naman dapat bigyan natin ng panibagong buhay ang isang simpleng bagay sa ating paligid, dahil ang isang simpleng bagay ay pwedeng pagandahin at gawing kakaiba sa pamamagitan ng masipag nating mga kamay at malikhaing isipan. I often wonder what I should do with Styrofoam after it has been used as a packaging material. Have you thought of that as well? Styrofoam occupies a lot of space when you store them, and you have no idea what to do with them. But then I saw the beautiful and colorful art works of Mr. Juan Tulas. It amazed me how such big bulks of styrofoam can be transformed into something small, colorful, and beautiful. it is a very Eco friendly. Art is something new. Be care on mother earth, be creative, be one, like of Mr. Tulas towards value of recycling. Art is something that has great value to many people. Art is everywhere. It lives in the soul, mind and even the heart. Art is an outlet for people to express themselves. Art is a way for the human mind to express itself. It is a form of expression. Art is the use of skill and imagination in the creation of aesthetic objects that can be shared with others. Every one of us has a unique mind to create something. Like Mr. Juan Elani Tulas he is very creative, and patience to do an art, recycling allows us to reuse materials that’s how Mr. Tulas made an art that he used styro. I appreciate Mr. Juan Tulas how he create that kind of art and he was not only creative but he also helps our environment. Maybe the purpose of Mr. Juan Tulas is to make people think that styrofoam is not only a garbage but in arts have a good result in our lives, I think everyone should recycle and help to save our environment. Art is how an artist express his/her ownself. It is his/her way how he/she interpret what or how he/she feels. What is i saw in the exhibit of Mr. Tulas is not just an art, but merely an environmental appreciation & preservation. I am so amazed on how he made the STYRO to a eccentric way of creation. Maybe what Mr. Tulas wants, is to make us realize that mother earth is in danger, so why not start conserving, preserving or recycle every piece of things that could save mother earth. In his works, you could reflect how people use the environment. i’m not that good in interpreting arts the ways others could, but what i appreaciate most to Mr. Tulas is that, he is aware of what is happening to the nature, hence made a way how to lessen the burdens of our nature. STYRO TO AN ART?? incredible isn’t it? STYRO? Not just a trash, but an ART! What I can say about the styro art is they are eye catching. The pieces of art capivates the mind and by looking at the images, it brings a message to your mind what the picture is telling the viewer or in other words, what the picture wants to say. I also want to emphasize what the artist used in his masterpieces. Imagine the artist used styrofoam instead of other canvass. The artist knows how to preserve nature by not disposing styrofoam but to use styrofoam in a more useful way. What I like to say is USING GARBAGE IN A MAGICAL WAY. In this world of creativity, there is what we called “art” which means a lot to us. Art is a creative human activity that is a way of expressing ones idea, feelings or emotions and to convey visually interesting forms. Art is also our way of living. We always encountered art in our daily life. Art is everything and everywhere. What we see around us is all about art and it is all product of art. Mr. Juan Elani Tulas is one of the greatest artists here in the Philippines. He is one of the Ilocano’s prides. His canvas are such so amazing and the word creativity in his works really takes place. You can see in his works what are on his mind and also you can feel what are in his heart. Every single portrait means a lot. While seeing his canvas, it tells us a lot and we view different perception and reactions about his works. His works signifies that Mr. Juan Elani Tulas is really a Filipino. All or most of his works tells about Filipinos lifestyle, their likes and most specifically the Filipinos cultures. His canvas is more on story views. These stories are related on the lives of Filipinos. Seeing his works tells that we Filipinos are rich in stories which signify that we are creative and more importantly is that we are artistic. 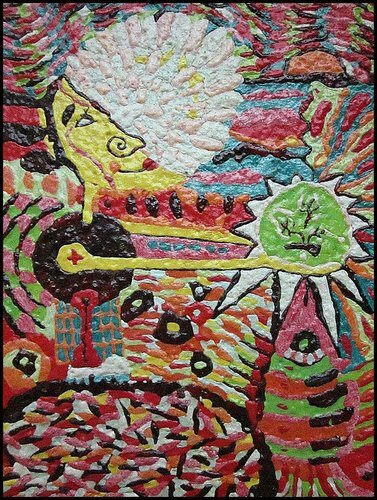 A canvas made of Styrofoam is an artistic and a creative work. This work that was made out of Styrofoam was by Mr. Juan Elani Tulas. His thinking is so wide that he comes out with the use of Styrofoam in making his canvas. He works with love and he is a nature-oriented person. He recycled this material to come out with a very beautiful output and thus helping our country in the problem of plastic garbage’s wasting. I can’t imagine how a wasted product such as Styrofoam can be use in painting or making a canvas and then was come out with a beautiful artwork. As I had seen his works, I was just amaze and made idolized him as a very creative artist. 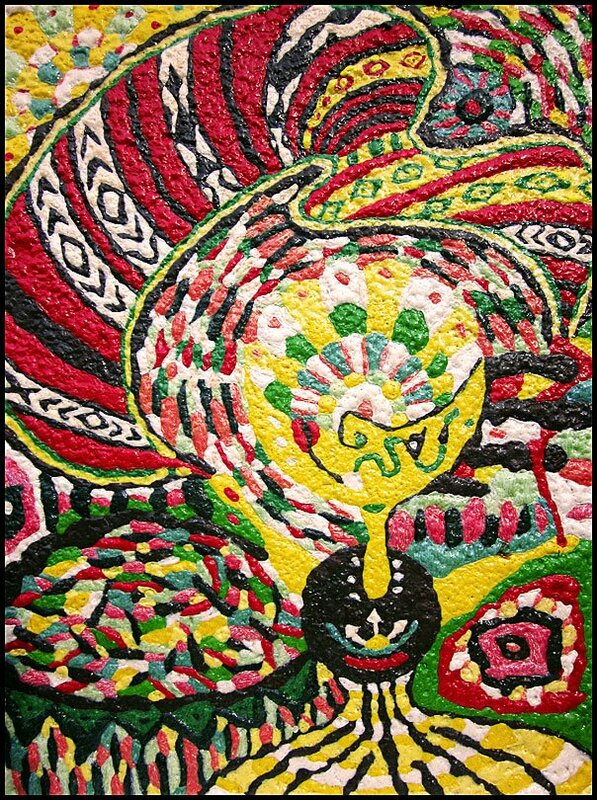 In the works of Mr. Juan Elani Tulas, I salute him because of using and recycling a Styrofoam in order to come out with a beautiful, amazing and a colorful canvas. It is good that there is a person like him and he was a good role model for us Filipinos. In this art exhibit that made by Mr. Tulas which entitled “Mga Kwentong Styro” helped the Filipinos to be aware about the problem of uncontrollable number of plastic wastes. This also awakens the Filipinos to start and made a solution for this problem. In this new era,with new high technologist, and people who didn’t care about the condition of our mother nature.we are so lucky to have some artist,very talented artist like mr. juan elani tulas who makes some unique painting that are made out of recycled materials like styro.artist like him are like new hero for our mother nature, because they are saving our nature by their unique ways.for me even though i dont have the eye of an artist to see the beauty of evert piece he did, i am amazed to see how stylish his works are, and i am honored to see some his works. if all of as realized how novel an artist like him was,by saving our nature by dangerous chemicals and objects like styro, we can appreciate their works, their hard works by doing a single piece of art that can help to save mother nature.we can help them by attending some of their exibits and patronizing our own Filipino artist. Mr. juan elani tulas is a very talented person he has a unique and wonderful idea on the styro become an arts or occupation requiring idea and skills production of a beautiful arts and he can express the mode and execution in a fine atrs manner form of fashion. the styro become an art because of melting the styro and add some colors and he can uses the recycle materials for the other needs.Beside on that tghe environment become cleaners because of throwing plastic we can melt and have some art and we can save the mother earth for not burning plastics and he can make an art and has inspiration on the skills of mr. juan elani tulas. besides on the styro art you cant see many books that you can read but for rent ,the story is so beautiful and we can reserve the book for the others can uses and kept for future uses and we need to patronize the Filipino artist. 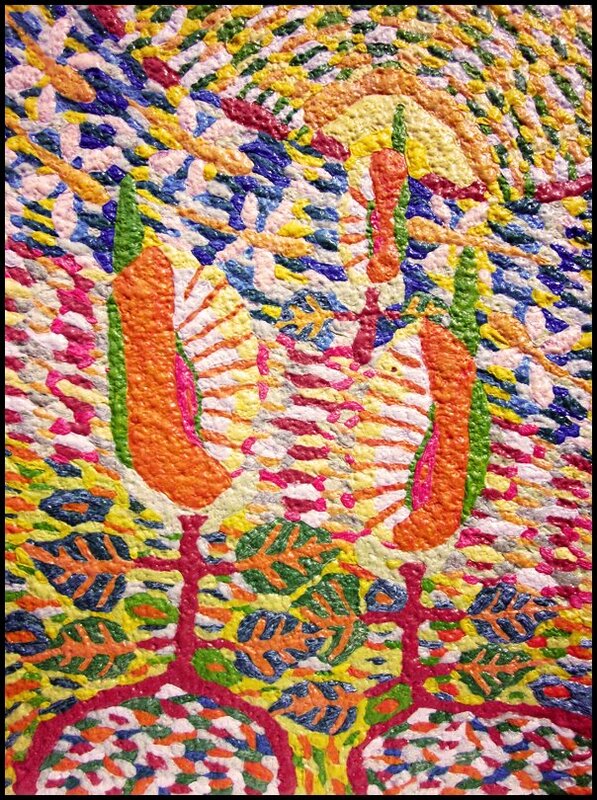 Juan Elani Tulas learned how to makes arts with his own without any formal instruction, and he created arts related from his individualistic styles, maybe from his past and present experience too, and most especially related from nature. I was amazed with his arts because it’s all about recycling and I imagined how important wasted products are especially Styrofoam, recycled wood or unused old wood. It’s impossible to look anywhere in this world and not see an artist’s creation or some aspect of art. It allows everybody to express themselves in any way necessary. With his art works, I’d learned lot of things like loving and taking care of our nature or environment, also about developing our skills or talent which makes into real whole human, and with his arts it made me realized how important RECYCLING is, in which it could challenge you to learn about some of the artists and their arts. This will not only give you more knowledge about who you are as an artist but also how to discuss the importance of your arts in the future.With his art,it is very important for the growth of the growth of the gallery and its relationship with the local and national art communities and to be able for us to see and appreciate the creation of our God like even wasted products(Styrofoam), which is also made for us to use and appreciate. Whether you are rich or poor, girl or boy there are no exemptions. Everyone has a God given talent. So discover it! You too might be famous in your own fields. The different artworks show how creative, intelligent, and resourceful Filipinos are. I was amazed when I saw his works; I cannot imagine that through the use of recycled scraps, you can come up with wonderful pieces of artwork. And I feel happy too, because his works are not only known locally but internationally as well. One thing I like is that, Sir Juan Tulas do have a deep sense of love and concern to our mother nature. Through recycling, we are helping to minimize our garbage problem that we are faced today. I admire him for his initiative, concern and dedication; for helping and discovering the hidden talents of Filipino youth. He has brought out the best in every Filipino youth. I hope that it will serve as an inspiration to everyone; we just need to open our eyes and stir up our resourcefulness. We don’t need expensive stuffs just to come up with world-class pieces of artwork. That it may also serve as an opener to our government and policy makers to intensify its programs on waste management, and support those artists like Sir Tulas whose talent is priceless and unique. Above all, we have equal roles to play and responsibilities to fulfill in solving our garbage problem that we are faced today. On the 28th day of July, I went to the exhibit room, when I get inside I saw a lot of paintings, so beautiful and colorful, I have no idea what are those paintings all about, all I know is just a simple paintings made by Mr. Juan Tulas. My first reactions to those paintings are filled with energy and expression. The energy of the paintings can be easily seen by the use of warm and cold colors .Expressionism on the other hand, it’s a little difficult for me to figure out each painting, for some reason it was hard for me to get a clear expression on what exactly Mr. Juan Tulas trying to express within those paintings. Maybe it was the way he used color or different objects and emotions. I thought that he uses a lot of analytical lines and expressive line in his work to form those paintings. If we say analytical lines are lines that are mathematical or exact while expressive line are lines that seems to spring out directly from the artist’s emotions and feelings. I think a lot of burns and hard work to come up with those paintings is based around the time and history of what he wants to become the paintings. Not only do I say this because of what I know about their symbolism, but because of the way he put some objects in his pieces. For example he puts human figures in his pieces maybe to represent life, another is birds maybe to represent a soul, also sun into their pieces maybe to represent a hope for days to come. In conclusion, I thought that making paintings using warm colors and burning Styrofoam to form those paintings is very creative, and those paintings caught my eyes because of the warm color he used, I like how he made us to think about his expression and create our own expression of his arts. Art is somewhat creative objects which are created for people to look and admire or think deeply about. They use it to express their feelings and serious meaning or ideas of beauty. We can see arts everywhere, we can also make creative arts in any materials trough wide imagination. For example colored papers, we can make beautiful arts in it, but imagine by the use of styro we can make arts? As we all know styro is just a material use in packaging appliances, foods, and etc, and we think that it is just a waste material, but for Mr. Juan Tulas gave life of it by transforming to a beautiful art, he is a nature lover, he used recycled materials like styro to come up with a unique work art. That arts is not just for local but international as well. The arts in that exhibit was totally fantastic, amazing and full of beautiful arts. I can say that Mr. Juan Tulas is a very intelligent in doing that kind of unique arts. I admired his masterpiece. We have all a hidden talent, we just have to know and discover it,. Living in an very rich world is an exemplary wonderful. Trees and flowers grows in every part of this world. Smiles that shows of joyous and memorable experiences whether happy or sad. Every emotion, spirituality, and well being has its own place to not to be replaced. Being an artist is one way of sharing a good thoughts and memories. Every artist has their own capabilities and talents of showing how wonderful the world is. A lot of talented artist has already showed their own aspects of art. Mr. Juan Tulas I can say really made art out of an art. Art in a way that just thinking a way of recycling a styro for a wonderful art that really contemplate the society of nowadays as it grows to the new world. In my eighteen years of existence, I have visited a lot of museum and art exhibits until I went Samtoy Bookstore, La Tabacalera Lifestyle Center, Laoag City with my friends. I was amazed and overwhelmed of what I saw, a very beautiful and inspiring artwork that attracts my attention and it was made of a Styrofoam, who thinks that a Styrofoam can be recycled like that? Only genius like Mr.Tulas has an idea on how to recycle those used Styrofoam. It is very Eco-friendly and it talks about the value of recycling. Mr.Tulas of Sinait Ilocos Sur is a person who has a very wild imagination and has a very creative mind. I also consider his artwork as a very helpful masterpiece to encourage and to lessen waste materials. This art inspires many people who will see this artwork to recycle their waste into more useful things, because of this artwork; it makes a change in me and gives knowledge and a brighter idea on how to be a more creative individual. We must and we should learn to Reduce, Reuse and Recycle before it’s too late in order to save Mother Earth. Art is a product of a creative mind. It reflects who we are and it shows what’s deep inside us. For me, after seeing those beautiful art exhibits made by Mr. Tulas, I could say that he is a very intelligent and a person who has a great love for nature. A lot of people have already thought of creating arts or something out of plastics and waste materials but Mr. Tulas, I think, is the first to think of using styros into a painting-like art piece. He serves as an inspiration to us – to think of things that we can do for our mother earth, but especially for ourselves. These artworks will last for long and these will remind the next generations about the importance of preserving the nature and maintaining its beauty. There are still a lot of things we can do for our own selves, for our own good. We just have to discover it and make it happen. We know that art is everywhere. There’s a quality, production and expression. We are aware of it that we are living in different forms of art. Though some people cannot appreciate and understand what’s the meaning of it. Mr. Juan Tulas arts are really unique and pleasing in the eyes of the viewers that I was one of them who visited. I did not expect that it was made of Styrofoam where in it is just a cheap thing but it made me amazed and also I can see that hi’s an eco-friendly painter and mind you the Styrofoam he used is not the cheap one but an expensive one even though it is only found at the dirty garbage. I felt the admiration and amazement because of its way of expressing his ideas and feelings. I elaborate that using Styrofoam is the best way to save our mother earth, recycle those garbages and transform to a new thing that everyone will not notice. Just like the art of Juan Tulas can be the example of how to save our mother earth. Because having the unity and cooperation we can help manage our mother earth. So be eco friendly to save mother earth like Mr. Juan Tulas.